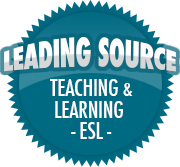 The Third-Person Singular “They” is Here to Stay | So, You Think You Can Teach ESL? What are your thoughts on a singular “they”? I’ve heard it’s been around since Shakespeare’s time, but it’s definitely become used more frequently (especially on Internet discussion boards). I think it’s good since English really has no gender-neutral singular pronoun (unless you count “it”, but who wants to be an “it”?). So check out this nifty post and pass on your thoughts!